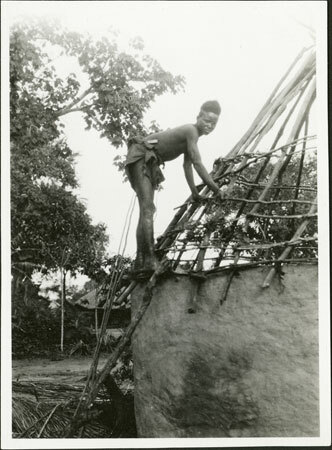 A youth (identified as Makana) tieing thatching supports to the rafters of a hut (of the type known as gbuguru or gbasendeyo) which has already had its clay walls constructed. Morton, Chris. "Zande hut roof construction" Southern Sudan Project (in development). 03 Jan. 2006. Pitt Rivers Museum. <http://southernsudan.prm.ox.ac.uk/details/1998.341.36.2/>.